Mitsubishi 4,700 Pound Sit Down Rider Style Forklift. Forklift is in good running and operating condition. 2410 hours on Hour Meter. The forklift is equipped with pneumatic rear tires, solid front tires, and comes with the operator’s manual. Note: Right rear tire has a split in the side wall, but is still holding air. Additional photos available upon request. Contact Bryan Fettet @ 985-783-4207 (fettetbl@dow.com) to set up an appointment to view the forklift. Sold “As Is-Where Is” with no warranties or liabilities. Dow recommends viewing to make your own determination of condition. LOAD OUT: Buyer is responsible for loading the forklift onto buyer's truck, securing the load, and logistics. Yale Sit Down Rider Style Forklift. Forklift is in good running and operating condition. 2980 hours on Hour Meter. The maximum lift height will reach 194” (High lifts) but require reduced capacity and restricted back tilt. The forklift is equipped with pneumatic shaped solid tires, and comes with the operator’s manual. 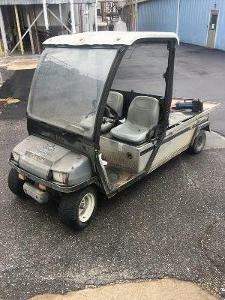 cab, front weight suitcase, powrquad plus transmission, vertical exhaust, super comfort seat W/air SUSPENSION, good working condition, serial#1L06430HLCH722781, site unit# 073-06412, 1149 hours, attachment pictured is not included. Case “Construction King” Forklift, Designed for Rough Terrain Use. Forklift is in good running and operating condition. 124 hours on Hour Meter. The machine was serviced regularly on a fixed time based, preventive maintenance program. The forklift is equipped with pneumatic tires and has an operator’s manual (poor condition-got wet). Sold “As Is-Where Is” with no warranties or liabilities. Dow recommends viewing the equipment to make your own determination of condition. The system is a CSK Ultrapure Water System. This system was designed to produce 30 GPM of ASTM Type I water. Major components include: Multi Media Unit ASME Stamped, P/N N5240-30, Tag # MM-100, Tank Size 30" x 72" Manufacturer: Alamo Twin Water Softener:P/N 4059T1, Model A450FM-29T1, Tag # WS-100, Tank Size 2 ea. 30" x 72" Manufacturer: Alamo RO Pressure Vessels ASME Stamped, P/N E8L/SP3, Tag # RO-200, RO-201, RO-202, 3 ea. 8.5" OD x 338" Manufacturer: Codeline Spiral Wound RO Elements: P/N 8822HR, RO-200, RO-201, RO-202 Manufacturer: TFC RO Booster Pump: P/N 35VD1K5HO, Tag #P-200, stainless steel vertical, 5 HP, 55 GPM nominal flow Manufacturer: G&L DI Pump: P/N 2SVD1H5HO, Tag # P-201, stainless steel vertical, 5 HP 25 GPM nominal flow Manufacturer: G&L Electrical: 2 ea. panels for PLC control. 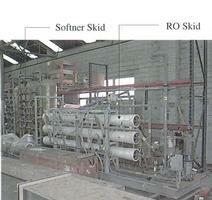 One on the RO Skid and one on the Softener skid. Contact: Kurt Heringhausen for questions and more information. LOAD OUT: Buyer will be responsible for rigging and transportation. 7 stage UF, each stage equiped with 736 10-HFP-276 FEG UF tubes in 46 passes of 16 tubes in series per pass.